Quintessence is based on the five elements that, according to the alchemists, make up the world: fire, water, earth, air, and the mythical substance aether. Aristotle included it as a fifth element distinct from the other four. It is believed to be the substance that fills the region of the universe above the terrestrial sphere and forms the heavenly bodies. Aether was also called Quintessence (from quinta essentia, “fifth element”). In physics, quintessence describes a form of dark matter. It is seen as the highest form of essence, the innermost core of a substance. The four elements and quintessence have very distinct qualities. Water is liquid, strives downward, and it can bring floods, tsunamis, or maelstroms. Fire burns, strives upward, and is a deadly force that delivers forest fires or man-made disasters such as 9/11 and (atomic) bombs. Earth strives downward. It is cold and dry. From it, volcanoes erupt, and earthquakes rock it. It holds a special place because alchemists believe it to be the “prima materia,” which spawned everything else through a process of “original insemination.” The air strives up in relation to the other elements. It can bring all sorts of storms, can be very hot (desert, draught) or cold (ice age). Quintessence is a greater force. It can bring Armageddon (metaphysical, or in the shape of a large meteorite that strikes the earth). Contrary to the others, it moves in circles. The Quintessence performance builds upon the characteristics of the elements. Each element is represented by one player, with video acting as an additional comment-track to the music, containing all five elements. In a Jungian sense, Quintessence explores the subconscious projections that the elements and related disasters invoke and how human society takes action and responsibility, or neglects to take it. The software used in the performance (Quintet.net) is a real-time interactive environment for intermedial composition and performance on local networks as well as the internet. 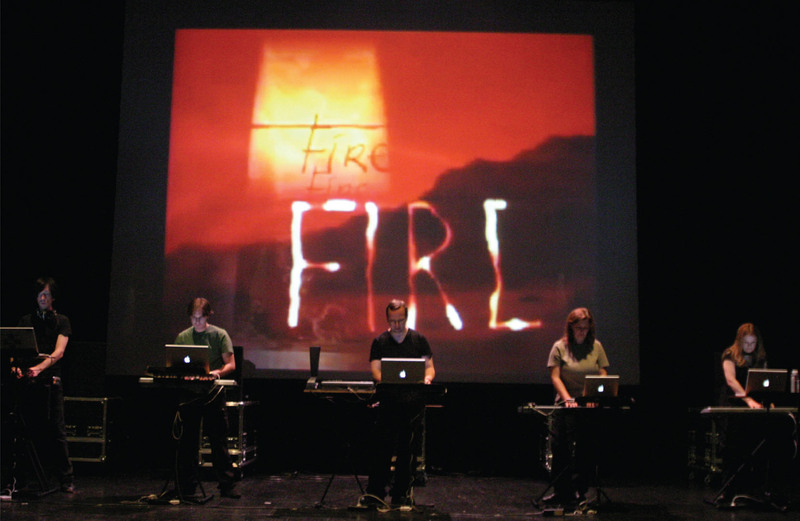 Since its premiere in 2000, the environment has been used in several large projects connecting players in Europe and the USA, including a Münich biennale opera project. In a virtual environment, Quintet.net implements the metaphor of five performers under the control of a conductor, so it deals with important aspects of symbolic, aural, and visual communication among the participants and the network audience. A composition development kit has been added to the environment (client, server, conductor, and viewer) to facilitate development of pieces that take full advantage of the wide continuum between composition and improvisation.